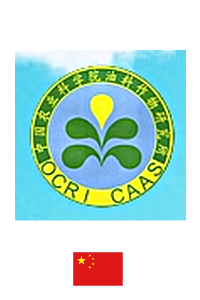 The Oil Crops Research Institute (OCRI) of the Chinese Academy of Agricultural Sciences (CAAS) is a national center specialized for oil crops research and development. It was established in 1960, sponsored by the Ministry of Agriculture (MOA). OCRI has rapeseed, soybean, peanut and sesame as its mandate crops with a mission to conduct basic and applied research which can lead to enhanced productivity and utilization of the oil crops. The current research fields cover germplasm, genetics, breeding, functional genomic, genetic engineering, safety assessment of genetic modified organisms (GMOS), plant nutrition and physiology, plant pathology, chemical analysis, food safety and product processing. Based on OCRI, several national research centers have been set up including the National Center for Oil Crops Improvement, Key Lab for Mycotoxins Detection of MOA, Lab of Risk Assessment for Oilseeds Products (Wuhan) of MOA, Key Lab for Oil Crop Biology and Genetic Improvement of MOA, Quality Inspection and Testing Center for Oilseeds and Their Products of MOA, Inspection and Testing Center of Environmental Biosafety of Transgenic Plants of MOA, and National Arachis Nursery. Totally, 264 scientists and supporting staff are working in the institute including 82 senior scientists.